Recorded in a number of spellings including Hull, Hulles, Hulls, Hullah, Hullar, Huller, Heller and possibly others, this is a surnme of pre-medieval English origins, of which there are several. The first is that it is locational from residence either at the city of Kingston upon Hull, but now generally known as Hull, or from living by the River Hull, now known as the Humber, in Yorkshire. Alternatively it can be topographical for a 'dweller by a hill'. However in both origins the derivation is believed to be from the Old English pre 7th Century word 'hyll', meaning a hill or hilly area. As the River Hull or Humber flows through some of the flatest land imaginable, it seems at best unlikely that the river name could have this meaning. Residential surnames were the earliest names to be created, as natural or man made features in the countryside, provided obvious and convenient means of identification. Robert Hullah on January 14th 1753, and John Hullah on March 2nd 1760, were both christened at the famous church of St. Marylebone in the city of London. 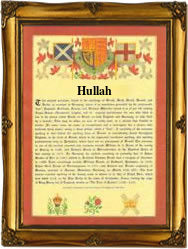 The first recorded spelling of the family name is shown to be that of Ralph le Hullere. This was dated 1327, in the Subsidy Tax Rolls of Sussex, during the reign of King Edward 111rd of England. He was known as 'The Father of the English Navy', 1327-1377. Throughout the centuries, surnames in every country have continued to "develop" often leading to astonishing variants of the original spelling.